rich characterization and vivid illustration of the impact science and technology have on our society. He is the author of twenty-four books, which have been translated into a dozen languages. He has won four Nebulas and two Hugos for his fiction. He began writing when he was very young, and was first published in Robert Lowndes' Famous Science Fiction when he was only fifteen years old. It took him five years to get his next short story published, but he was being published on a regular basis by age 23. The first novel Bear sold, Hegira (Dell), appeared in 1979. His novel, Moving Mars (Tor, 1993), won the 1994 Nebula Award for best novel. Recent novels by Greg Bear include: Dinosaur Summer (Warner, 1998), Slant (Tor, 1997) and Legacy (Tor, 1995). Greg Bear also wrote Foundation and Chaos (Harper Prism, 1998), the second book in the Second Foundation Trilogy, (an extension to Asimov's Foundation novels) with Gregory Benford and David Brin penning the other two books in the trilogy. Bear's latest work is Darwin's Radio (Del Rey, 1999), a fascinating scientific thriller about a dramatic change in human evolution and its impact on the human population, society and government. The human interest element of the story focuses on the impact the dramatic evolutionary change has on two scientists in love, who experience the natural upgrade to the human species first hand. Kirkus Reviews calls Darwin's Radio, "Absorbing and ingenious," and Library Journal comments, "Filled with the author's lucid intelligence, this compelling novel should appeal to fans of science mystery as well as to hard-core sf readers." Currently, he is at work on an upcoming Star Wars novel, Rogue Planet. In addition to his novels, he has written and published numerous short stories and freelance articles. In 1984, "Hardfought" and "Blood Music" won the Nebula Awards for best novella and novelette, respectively; "Blood Music" went on to win the Hugo Award. In 1987, "Tangents" won the Hugo and Nebula Awards for best short story. His short story, "Dead Run," was adapted by Alan Brennert for the second Twilight Zone television show. He has written numerous articles on film for the Los Angeles Times and reviewed books for the San Diego Union Book Review supplement between 1979 and 1982. 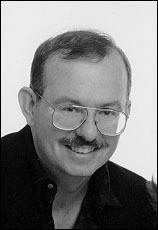 Greg Bear has also worked as a bookseller and lectured for the San Diego City Schools, acting as a roving teacher and conducting short classes on ancient history, the history of science, and science fiction/fantasy. As an illustrator, his artwork has appeared on Galaxy, Fantasy and Science Fiction and Vertex and books both hardcover and paperback. These days he does very little artwork, devoting himself almost exclusively to writing. He has served at several positions with SFWA, including Vice President of SFWA for a year, and President for two years (1988-1990). He has also served on the Citizen's Advisory Council on National Space Policy, consulted with Microsoft and other software companies and served as science and speculations advisor for the pilot episode of the Amblin/Universal TV production Earth 2. Married to Astrid Anderson Bear, he and his wife are the proud parents of two children, Erik and Alexandra. Greg talked with us about his hot new release, Darwin's Radio, discusses changes taking place in the science fiction market and publishing industry, and gives some great advice for beginning writers. When did you first know you wanted to be a writer? How did you get your first big break? I started writing seriously when I was nine years old, and sold my first story when I was fifteen. But my first big break was probably with the publication of my novels Blood Music and Eon in the same year. That attracted a lot of attention. Winning two Nebulas and a Hugo in the previous year certainly helped, as did the publication of my short story collection, The Wind From a Burning Woman, in 1983. Let's talk about your recent novel, Darwin's Radio. How did you manage to include so much technical science into the story without losing the rhythm and complex characterizations that the book contains? I've been researching modern biological discoveries in genetics and microbiology for the last five years, catching up on my research for Blood Music fifteen years ago. It's exciting all by itself, so it wasn't hard creating interesting situations that flow with the science. Studying science also means studying scientists, and understanding how they think and live adds to the mix. Kaye Lang is an exciting character who is not only making theories that go against the grain of science, but testing them out on herself. How did you create the character of Kaye? Kaye comes from a long study project in my career--understanding how to write believable women. There are differences between men and women, but they're subtle--and you have to know where to look, and how to accept the many ways in which we're similar. All humans vary, of course, so one should never be dogmatic. And that is the secret--no dogma, just patience and observation. As I said in Slant, "We're all different sexes, but with only two types of equipment." Do you feel that the rapid advance in technology and increased population growth is causing so much stress in humans that something similar to the catastrophic evolution which occurred in your novel could actually happen? We clearly could use an upgrade in significant ways--particularly communications skills. Whether this will happen naturally or whether we'll take the reins and do it ourselves is still an open question! To what extent are the HERV and SHEVA retroviruses in the book based on fact? HERV--Human Endogenous RetroViruses--are real, many of them are quite ancient (up to thirty million years old) and the subject of hot interest today. SHEVA, an infectious ancient virus buried in our genome, is still fiction--but I see no reason why one or more couldn't exist, and emerge someday. The government, news media and religious sects play a significant role in Darwin's Radio, as does the man verse woman scenario, with men blaming them for the unfertilized pregnancies. These aspects made the novel also interesting as a human-interest story. How did you create these large social and political movements in the novel? Did you look at any social revolutions from history for guidance? I read a lot of history and I grew up in the sixties, so it wasn't too much of a stretch to replay those experiences and those emotions and add them to historical observations and personal speculations. I also toured the CDC and NIH, and I've worked with various consulting groups and think tanks, which also adds to my picture. How much of the human pregnancy and birth process you wrote in the novel came from your own life experiences? I watched both my kids be born--quite an amazing experience! Modern births can be quite high tech, very efficient, and yet very humanly arranged and very satisfying. Both of my kids were born without major difficulties, under relatively natural conditions, in a hospital birthing center, with midwife and doctor participation--all very positive and very helpful in writing these scenes! Can you see Darwin's Radio as a feature film or television mini-series? "Kaye comes from a long study project in my career--understanding how to write believable women. There are differences between men and women, but they're subtle--and you have to know where to look, and how to accept the many ways in which we're similar." There's been a lot of interest in Los Angeles on filming the book, but right now, Hollywood studios seem to be in a bit of a funk about developing projects. Everyone's noticed this--not just me. This ridiculous situation may change in the next year or so, but who knows? The whole world is being run by bankers who would rather invest in somebody else's company in the stock market than take any risks with their own products. Darwin's Children will probably be written in the next two years. Some of your novels (Queen of Angels, Eon, Eternity) have involved advanced scenarios about how humans access and provide information such as electronic libraries, one central information outlet, etc. The Internet could easily be the beginnings of something like this. How do you think human beings will access information 25 years from now? I really have only the most minimal clues. I suspect all the hot topics of today's multimedia (oops! outmoded word) speculations will be in effect by then, 3D, virtual reality with high bandwidth, direct transfer of entertainment to consumer players over the internet, mobile communicators that combine readers, phones, internet connex, etc. I'd like to talk a bit about the creative process. What are your writing habits like? I write every weekday and feel down if I don't get at least five pages done! Have you ever suffered writer's block? How do you overcome it? Fortunately, I've never suffered from writer's block. Just delays as I figure out how my plot is going to advance! How do you approach the research necessary for your novels to ensure that the science in the book is accurate? I read magazines, journals, and textbooks, then talk with scientists and try to get tours of where they work. I then have scientists (and friends and relatives with technical knowledge) read the books and try to weed out all the errors. With Darwin's Radio, different groups of scientists caught different errors--the subject matter was that broad! "Ebooks will probably replace paperbacks in the next ten years. Hardcovers and art editions will likely prosper a while longer." No one knows quite what the effect will be. Right now, it's a challenging time to start a career; you have to put your best work forward from the git go. No time for training, or earning money while learning craft. Two or three books and if your sales are not up to snuff, you may have to change your name and start over again. Right now, there are only five or six viable publishers of book length fiction. We'll have to see how their arrange their departments and imprints and whether or not these departments are allowed to bid against each other for books. What advice do you have for aspiring SF writers who are feeling discouraged about breaking into the market today? Keep writing, and remember--good work will get published. Beginning novels and the mediocre work are suffering--along with the experimental, possibly, and the unusual. But good writing will get published and will endure. Getting rich at writing has always been a dicey proposition! I'd like to talk about your work as an artist. How did you first get interested in painting? What works are you the most proud of? I started painting seriously when I was sixteen, and published a few magazine covers and a couple of book covers before moving completely into writing. I'm most pleased with my Bradbury artwork, viewable on my web site, gregbear.com. How do you feel about ebooks? Do you think they will ultimately replace regular books? Ebooks will probably replace paperbacks in the next ten years. Hardcovers and art editions will likely prosper a while longer. What was it like collaborating with Second Foundation Trilogy co-authors Gregory Benford and David Brin? Did the three of you enjoy continuing Asimov's work? We had a great time working with Isaac, and with each other. The result speaks for itself--the new trilogy has gotten very positive responses. At no time did we ever intend to replace Isaac, however--remember, it took three of us to fill just one pair of Isaac's shoes! How much do you follow new scientific breakthroughs and discoveries? What recent discoveries have peaked your interest? As I said, I read the journals all the time. I'm still tracking biology--every day, something amazing is published! Right now, we're learning that many plant and animal species can adjust their physical form, under specific kinds of stress, in less than a generation--water fleas and wild radishes just recently joined the list. This isn't that different from what happens in Darwin's Radio. What's next for Greg Bear? Another novel! And I'm finishing a Star Wars book now, Rogue Planet. It's set after Episode 1 and before Episode 2. That'll be published next year. What do you like to do for fun when you aren't working? Hang out with my family, and of course, read, listen to music, watch movies! How do you plan to spend the upcoming Millennium New Year's Eve? Not sure yet! We're usually pretty quiet on New Year's. After all, time doesn't mean the same thing to science fiction writers.